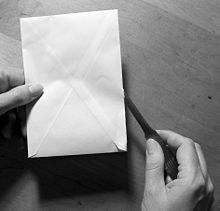 The secrecy of correspondence (German: Briefgeheimnis, French: secret de la correspondance) or literally translated as secrecy of letters, is a fundamental legal principle enshrined in the constitutions of several European countries. It guarantees that the content of sealed letters is never revealed, and letters in transit are not opened by government officials, or any other third party. It is the main legal basis for the assumption of privacy of correspondence. The principle has been naturally extended to other forms of communication, including telephony and electronic communications on the Internet, as the constitutional guarantees are generally thought to also cover these forms of communication. However, national telecommunications privacy laws may allow lawful interception, i.e. wiretapping and monitoring of electronic communications in cases of suspicion of crime. Paper letters have, in most jurisdictions, remained outside the legal scope of law enforcement surveillance, even in cases of "reasonable searches and seizures". When applied to electronic communication, the principle protects not only the content of the communication, but also the information on when and to whom any messages (if any) have been sent (see: Call detail records), and in the case of mobile communication, the location information of the mobile units. As a consequence, in jurisdictions with a safeguard on secrecy of letters, location data collected from mobile phone networks has a higher level of protection than data collected by vehicle telematics or transport tickets. No law of Congress can place in the hands of officials connected with the Postal Service any authority to invade the secrecy of letters and such sealed packages in the mail; and all regulations adopted as to mail matter of this kind must be in subordination to the great principle embodied in the fourth amendment of the Constitution. The protection of the Fourth Amendment has been extended beyond the home in other instances. A protection similar to that of correspondence has even been argued to extend to the contents of trash cans outside one's house, although unsuccessfully. Like all rights derived through litigation, the secrecy of correspondence is subject to interpretations. By Supreme Court precedent, rights derived from the Fourth Amendment are limited by the legal test of a "reasonable expectation of privacy". ^ Roxana Maria (2009). "The Legal Protection of the Secrecy of Correspondence" (PDF). Curentul ”Juridic”. Tîrgu-Mureş, România (1). ^ "Chapter X, Fundamental Rights and Duties of Citizens, Article 128". 1936 Constitution of the USSR. The inviolability of the homes of citizens and privacy of correspondence are protected by law. ^ Philippos K. Spyropoulos; Philippos C. Spyropoulos; Theodore P. Fortsakis (2009). Constitutional Law in Greece. Kluwer Law International. p. 228. ISBN 9789041128782. ^ DAVID JOHN MAROTTA (June 15, 2013). "Right to Privacy of Correspondence of Other Countries (section: Greece)". ^ "Constitution to extend protection to e-mails". Ministry of the Interior and Kingdom Relations - Government of the Netherlands. 11 July 2014.